Rules for Radical HOAs - Neighbors at War! Finally, emerge from your voyage of discovery and analyze how the HOA movement has slowly and stealthily taken over the American real estate development and home building industry. Slowly, this industry has moved almost a quarter of all Americans into a political system which is completely outside the control of the U.S. Constitution. Make no mistake, Homeowners Associations are absolutely a form of government. They control your roads, your sewer, your trash pickup, maintenance of your local water system, policing of your neighborhood. They even form your court system, since traditional courts have washed their hands of most HOA conflicts. And to an incredible degree they control your personal finances. Of course, just like in a traditional government you pay taxes. Your monthly dues and the sudden demand for a $10,000 or $20,000 special assessment are taxes. What rights do you actually have in an HOA? Well, what rights do you have under facism, or marxism, or communism or any other kind of non-constitutional dictatorship? Nila Ridings is right. We all need to read Rules for Radicals, just to see what we’re up against. I am amazed people still don’t get this. Handing over money is food for the monster. If the monster is not fed, it dies. In the case of HOAs, every homeowner/condo owner holds the ultimate power. If they didn’t hand over their money the HOA would collapse. There would be no money to use for suing and foreclosing on all of the owners or even 50% of them. But getting enough owners motivated to bring about a complete revolt is impossible. Why? Because the people who buy into a maintenance-provided community are weak by nature. They want somebody else to take care of everything, not just mow the lawn or trim the trees. They are not concerned about the finances, the budget, lawsuits, loans, settlements, vendors, kickbacks, self-dealing, kickbacks or anything else. By this very attitude, laziness, or apathy they make themselves targets. The power-hungry board members jump on the opportunity to take advantage of them. Those that wise up sell and move out. Those who have a little bit of a backbone stand up. And suddenly they find themselves being hit by the firing squad of the board members, property manager, and HOA attorney with a mission to shut them up. Silence them. Do not allow them to share any information about questionable behavior by the board. Bullying and bankrupting that person becomes the goal. The ultimate win for them is to bury that person in the cemetery. When others witness such treatment they zip their lips. And the control over everyone is back with the board and their cronies. Some of those that participated in the rallying decide to become board members and take up the exact same bullying practices that they previously stood up against. Years ago I realized the HOA I bought into felt more like a cult. And those who don’t follow the leaders are targeted for removal at all costs. All paid for with the dues of the members with a high percentage of them having no clue what is taking place. In many cases these homeowners live with a blind faith and trust that the government has laws in place to protect them. “You should have read the rules before buying” is, at best, a poor argument when the rules change like a moving target. And things like the treasurer shall cause an annual audit would lead the buyer to believe the money is accounted for. That very statement was contained in the CC&Rs of my HOA. How would I have known the board ignored it and didn’t have any accounting on $10 Million must less an audit? I was not told about that because there is no law that requires me to be told that. And for two years after I moved in and attended the monthly meetings the nine board members (who knew the audits had not been done) continued to lead me to believe the financial information was at the accountant’s office and would be forthcoming. Deception appears to be an accepted way of doing business in the world of HOAs. Yet, if a buyer into an HOA would submit an income of $50K more per year than they actually make to the mortgage lender that would be considered fraud. The constant turmoil of HOA living takes a toll on the quality of life; health, happiness, financial well-being, marriages, and safety and security. 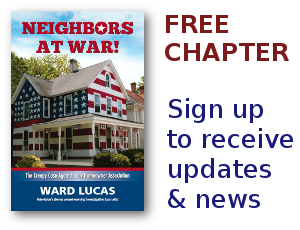 Yes, substantial HOA reform legislation is a social and political MOVEMENT! Adovates must adopt a strong acceptance that state legislators and other parties to the “unspoken alliance of no negatives about HOAs,” the media and legal-academic elitists oppose any reforms. Adopting the approaches, tactics an strategies in “Rules for Radicals” is a necessary ingredient for success. See my Rules for Engagement on my website: http://pvtgov.org for a shorter version of an approach that has proven successful over the years.